If you visit Los Angeles, you might be surprised to find that there are two Getty Museums in LA: the Getty Villa and the Getty Center. Before you start planning, you should know what's where. If you're looking for the big museum with white buildings, sitting on top of a hill and designed by architect Richard Meier, that's the somewhere else. Use the Getty Center guide to find out how to visit it. The Getty Villa in Malibu is the original museum started by J Paul Getty, filled with antiquities from Greece and Rome. It's very enjoyable if you like those things. If you aren't interested in the Roman architecture or the ancient art, it may not be the place for you. The museum complex includes a 450-seat outdoor classical theater, the villa, and a cafe. You can go to the Getty Villa just to see their building. It's like stepping back a couple of thousand years into a Roman-style villa. To be precise, it's a reproduction of the Villa dei Papiri; a first-century Roman country house unearthed at Herculaneum which was buried when Mt. Vesuvius erupted in A.D. 79. You can also go to see the villa's collection which is one of America's finest holdings of ancient Greek, Roman and Etruscan art. You'll see objects created over 7,000 years between the end of the Stone Age and the fall of the Roman Empire. Besides the artwork, the Getty Villa stages performances that include re-imagined versions of classic Greek and Roman dramas, as well as new and adapted works inspired by the museum's holdings or the ancient world. Admission is free, but you need an advance, timed-entry ticket and they charge for parking. The Villa is magically quiet shortly before the official opening time. Reserve the earliest entry time of the day, arrive a half hour or so before that to enjoy the grounds. If you wait too late to reserve, you may find they are filled up. To avoid that, get your parking reservation as far ahead as you can on their website. At the last minute, you might get lucky. They sometimes release a few same-day tickets at 9:00 a.m. Check for them online or call 310-440-7300. Take the orientation tours and weekend gallery tours to learn more about what you're seeing. Before plunging into the museum itself, look over the daily schedule of tours, gallery talks, and events, and plan your visit around them. Then sign up for them right away. Some tours will only take a limited number of people, and on others, they can run out of audio headsets. Get more out of the museum with a GettyGuide. It's like getting a private tour with the museum's curators and conservators. You can pick up a multimedia player free of charge at the GettyGuide Desk just inside the main entrance. Don't take big bags or packages. You'll just have to check them at the entrance. You'll also have to leave your umbrella in the cloakroom, but the museum provides plenty of them for you to use if you need them. And don't carry anything embarrassing. Your bags may be searched. Got questions? Look for the people in white shirts and vests. They have answers. The Cafe serves casual Mediterranean fare, which is quite tasty. You can take photographs for personal use only, but no tripods or flashes are allowed. You can use your selfie stick, but only in public outdoor spaces. Child-carrying backpacks can't go into the galleries. You can get their hours and more information on the Getty Villa website. Most visitors arrive in a private vehicle. Vehicles over 6'10" high and standard car length/width aren't allowed, and there is no oversized vehicle lot. The Getty Villa address is 17985 Pacific Coast Highway in Pacific Palisades, California. It's easy enough to put that address into your GPS, but if you overshoot the driveway entrance, you'll end up frustrated. So pay attention. The only entrance is from the right lane of southbound Pacific Coast Highway. If you are driving north on PCH, you can't make a left turn into the entrance and will have to drive to Sunset Boulevard and make a u-turn. 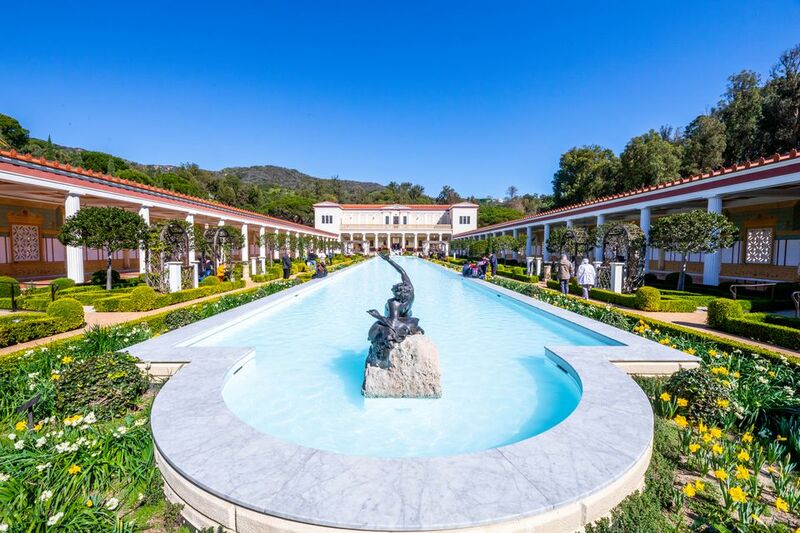 The Getty Villa is less than a mile north of the intersection of Pacific Coast Highway and Sunset Boulevard. It's worth it to pay extreme attention for that entire mile. If you miss your turn, here's what to do but it will take a while: Continue south to Topanga Canyon Boulevard, turn back north there. Go all the way north to Sunset to make another u-turn. On your way to the parking garage, you may wonder why the driveway is so rough. This place is so authentic that the road is paved with large stones similar to the ones found in the streets of ancient Herculaneum and Pompeii. If someone is dropping you off, the entrance gate staff will direct you to the drop-off area. If you are using a ridesharing service, don't let the driver drop you off outside the entrance. If you walk in from there, they won't let you enter. They're not snooty, but just following the conditions of their permits. Pay attention to where you park. After a few hours of museum-browsing, it's easy to forget where you started. Write the location down or take a photo. Don't be lazy. Walk up the hill from the parking garage to the museum entrance if you can, to enjoy the gardens and views. No matter how hard you try to get around this, you can't walk into the Villa. The museum's permits forbid that. The one exception is if you take Metro bus line 534, which stops at Pacific Coast Highway and Coastline Drive, directly across from the Getty Villa entrance. You will still need an advance, timed ticket and you will have to show your bus receipt or transfer at the gate.